Psoriasis is an autoimmune disease that causes raised, red, scaly patches to appear on the skin. It typically affects the outside of the elbows, knees or scalp, though it can appear in any location. It can be itchy, burn and sting. Psoriasis is associated with other serious health conditions, such as diabetes and depression. While experts do not know what exactly causes psoriasis, we do know that the immune system and genetics play major roles in its development. Usually, something triggers psoriasis to flare. The skin cells in people with psoriasis grow at an abnormally fast rate, which causes the buildup of psoriasis lesions. Psoriasis often develops between the ages of 15 and 35, but it can develop at any age. Psoriasis is not contagious and it is not something you can “catch” or that others can catch from you. There are no special blood tests or tools to diagnose psoriasis. 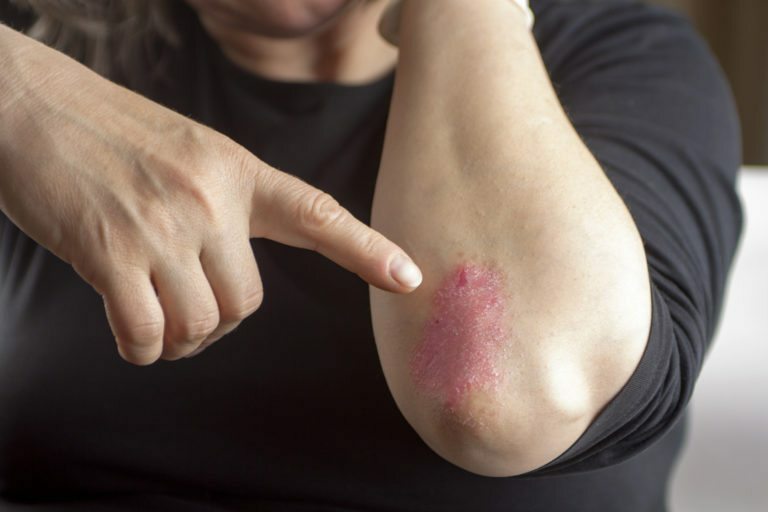 Most commonly, a diagnosis of psoriasis can be made after a full medical history and physical exam is performed by our dermatology certified provider. Sometimes, a small sample of skin (biopsy) is taken and sent for examination under a microscope by a board certified dermatopathologist to determine the exact type of psoriasis and to rule out other disorders. Will you develop psoriatic arthritis? Roughly 11% of patients with psoriasis have also been diagnosed with psoriatic arthritis. However, approximately 30% of people with psoriasis will eventually develop psoriatic arthritis. Psoriatic arthritis often may go undiagnosed, particularly in its milder forms. However, it’s important to treat psoriatic arthritis early on to help avoid permanent joint damage. If you need a specialist to manage your psoriatic arthritis, our staff can help refer you to a psoriatic arthritis specialist. How is your psoriasis treated? Psoriasis can be treated many ways and each patient responds differently. Treatment options include topical medications and systemic medications. Used alone, creams and ointments that you apply to your skin can effectively treat mild to moderate psoriasis. When the psoriasis is more severe, topical creams can be combined with oral or injected medications. Our goal here at Biltmore Dermatology is to help you best manage your psoriasis with the most advanced treatments and the fewest side effects. If you would like to schedule an appointment with our dermatology certified provider to discuss your psoriasis, please call our office and one of our staff will be happy to assist you.